The famous and easily recognizable island abbey of Mont Saint-Michel, is just across the border of Brittany, in Normandy. 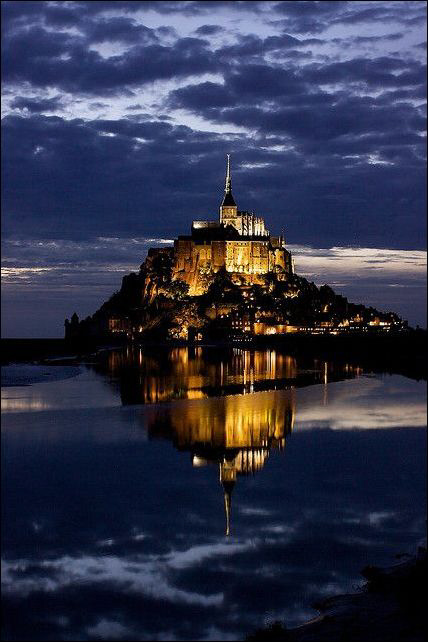 It is stated, in the prophecies of Marie-Julie Jahenny, that Mont Saint-Michel will survive the 3 Days of Darkness Chastisement and serve as a fortress for us. TCW is recommending all True Catholics (those under obedience to the Apostolic Succession of Gregory XVII) to meet at *Mont Saint-Michel, to fortify our ranks, after "the 3 Days". That's great news. Would like to be a part. To "reserve" a spot do we need to call a Papal Restoration staff member? The date for the next (group) meeting of True Catholics to receive all necessary Sacraments, to get Candles blessed, and to spend time together, is Fri, May 20th thru Sun, May 22nd, 2016. More information will be forthcoming. There are no restrictions on foreign real estate buyers in Brittany. Transactions are conducted through a notary, who handles contracts and closings, and ensures that taxes are collected and paid. Are we drawing near to the 3 days of darkness? How can we survive? Yes, we are drawing nearer. 3 things: 1. Make sure you reject all non-Catholic sects like the Novus Ordo sect & their SSPX, the Sedevacantist lie, etc. 2. Get any censures lifted. 3. Obtain a properly blessed beeswax candle for "the 3 Days". How will we cross the ocean after the great chastisement? Well, North Americans had done it for quite some time before the discovery of gas powered engines. Also there may be totally abandoned ships we could use. Even GPS may still work for sometime as the satellites they use now are self powered.